There were six F1 cars running up the front. Six F1 cars running up the front, but if one F1 car would accidentally fall, they're be five F1 cars running at the front. And so it goes, a childish rhyme which neatly summed up what happened in the 2005 Canadian Grand Prix. By the end of the song there was only one green bottle left. Kimi Raikkonen ended up winning the race but it had looked an unlikely result at the start of the event. Kimi might have been unlucky at the Nurburgring but in Canada luck was on his side. And as his rivals fell off or broke down, he emerged with a big win. A win which negated the loss of points at the Nurburgring. The slate was wiped clean. Fernando Alonso got 10 points at the Nurburgring. Kimi got 10 in Montreal. For once the weather men were right in their forecast. The weather was hotter than the rain forest and pretty much as humid as well. A rain storm would have been nice. The crowd was huge, the biggest yet in Montreal, and there was a lot of excitement in the air because the grid was such a strange one. Would it be Button or Schumacher who made it ahead and what would that do for the different strategies? The funny thing was that no-one had really thought that the two Renaults would get there first. And fastest of all was Giancarlo Fisichella, who went to the right of Button while Fernando Alonso went to the left of Michael Schumacher. Button held on to third while Schumacher had his work cut out holding back the McLarens - or at least trying to. Montoya was ahead at the first corner and Raikkonen showed his class but going around the outside of Michael and grabbing fifth place. A miserable Michael was sixth and he had a small tank of gas. The locals had no time to get excited about Villeneuve because on the first lap he tagged Takuma Sato and went off to the pits for a new nose. And so there we had it. A Renault 1-2. Button trying but failing to keep up and then the two McLarens. And then Michael Schumacher. The Ferrari was going quite quickly but after just 12 laps it headed for the pitlane. That was not a strategy that was going to work and as Michael tumbled back to 12th place, we concentrated on the real battle for the win: between Renault and McLaren. Who would go longer in this battle? And who would have the tyres to do the job at the end of the race? We figured that Button would disappear early into the pits and he did exactly that, disappearing into pitlane after 15 laps, a strategy that dropped him back to seventh place. Also disappearing at that point was Ralf Schumacher, who was obviously not going anywhere in a hurry as he dropped from 11th to 16th. As the laps reeled off, the McLarens started setting more and more fastest sector times and then fastest laps. Their tyres were holding up better. It was not until lap 23 that the first frontrunner pitted when Toyota's Jarno Trulli dropped from fifth to eighth. This put Button up to fifth place and Michael Schumacher to sixth. Mark Webber was up to seventh but was showing no signs of pitting. The car, he had said, worked better on long runs and so we were not expecting to see Mark in the pits for a while. The interesting thing was that on lap 24 Alonso and Raikkonen dived into the pits a few seconds apart. This put Montoya briefly to second but a lap later he and Fisichella came in. Fisi came out ahead and as Montoya emerged it was a fight for second with Alonso. Down at the corner Montoya pushed it too hard and slid wide onto the grass. Second place was gone but he held on to third ahead of Raikkonen, who was unhappy with a steering wheel that was not centred as it should have been. In such a circumstance caution is the sensible course of action. It was clear then that barring something weird, the winner would come from Renault or McLaren. On lap 33 Fisichella suddenly slowed with an hydraulic problem. He drove around to the pits, climbed from the car and stalked away into the garage. Another good effort ruined. Alonso was in the lead after that and managed to stay a couple of seconds ahead of the two McLarens. Six laps later, however, Fernando made a mistake (a rare one) and clonked the wall on the fast section of track at the back of the circuit. That was the end of him. This left Montoya leading Raikkonen by about five seconds. It was the perfect result for McLaren, although obviously Raikkonen would want to have been ahead. The team decided to play safe and go for a 1-2 with Montoya getting his first win. Button was 30 secs behind and had Michael Schumacher closing in on him. And then Jenson hit the wall at the last corner. "It was completely my mistake," he said. A Safety Car was sent out but the timing was wrong for Montoya. When the team called for him to stop, he had just passed the pit entry. He was screwed. The McLaren radio was probably fairly lively at the time as the frustrated Montoya realised what had just happened. His race was ruined. He would be no better than eighth. The big winner on strategy at that moment was Barrichello. He had started the Canadian Grand Prix from the pitlane after a gearbox problem in qualifying. In such a situation it was normal for him to have a huge load of fuel on board and so he took it very easy in the early laps as he picked his way through the normal melee of Minardis and Jordans. He stayed out for 31 laps and was up to eighth when he stopped, which dropped him back to 12th. The problem was that he had no radio. The fact that he pitted at exactly the right moment was an inspired decision by Rubens (who presumably had seen the SC boards, indicating that the Safety Car was out. As a result he moved from a distant seventh to a competitive fifth. Schumacher had also gained a lot of ground and was close behind Raikkonen. When Montoya did come in, he was no doubt a little emotional. He had through no fault of his own just lost what looked like being a victory. Rather than putting his head down and trying to fix the problem Montoya then compounded the problem by driving through a red light at the end of the pitlane. That was "Game Over" for Monty. The FIA Stewards duly announced that he be black-flagged. And so in a flash we had lost Montoya and Button and Michael Schumacher had closed right up. Raikkonen was fine. He had the Ferrari covered but conditions were difficult and with a few laps to go Kimi slid over a chicane and Michael was suddenly right with him. But it was not a problem and so Kimi duly won. Michael was second, which was a good result, but the car really did not deserve such a result. Barrichello was third, which was a great result coming as it did from a race that began in pitlane. 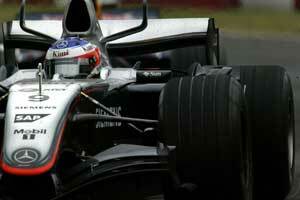 Rubens gained the place when Trulli disappeared with no brakes at all. At the end Rubens was just ahead of Felipe Massa and Mark Webber both of whom were charging. Webber's race had been difficulty and he had two mistakes as his tyres refused to heat up after the pit stop and the Safety Car. On both occasions he lost places and would probably have been on the podium but for the errors. Massa suffered during one of Webber's moment as Barrichello was able to pass him. In other words Massa might also have been third. But then again it was one of those days. The other points scorers were survivors: Ralf Schumacher was sixth, a lap behind, as were Red Bullers Coulthard and Klien, who rounded off the top eight. The other survivors were Villeneuve, Monteiro and Albers.